Gotta love festival announcements. They usually come out of nowhere, they usually are pretty dope, and they give us something to long for. Such is the case with UK's prominent metal festival, Bloodstock Open Air, whose second lineup announcement for 2019 we were stoked to see. And you will be too. Following the confirmation of Sabaton as a headliner on Friday, August 9th, the festival revealed today six more bands. 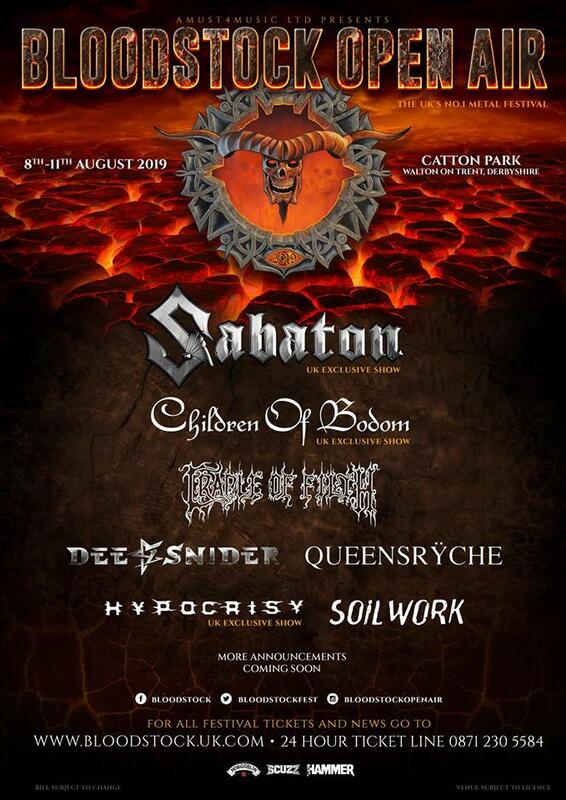 Children Of Bodom on Friday at the Ronnie James Dio stage, in an exclusive UK performance while, Cradle Of Filth will be setting main stage on fire on Saturday. Soilwork who are confirmed -also exclusively- for a Sunday slot, much like Dee Snider of Twisted Sister and Queensryche on main stage. Finally, Peter Tagtgren's Hypocrisy will be joining the main stage lineup on Saturday. Early bird tickets are still available for limited time at bloodstock.uk.com. Bloodstock Open Air is taking place on 8-11 August 2019 in Cottonpark, Walton-On-Trent, Derbyshire.